HOUSTON, Oct. 2, 2017 /PRNewswire/ -- Boardwalk Pipeline Partners, LP (NYSE: BWP) announced today that its Texas Gas Transmission Company, LLC subsidiary (Texas Gas) has filed with the Federal Energy Regulatory Commission (FERC) seeking approval to restructure some of its existing firm transportation agreements and enter into new firm transportation agreements with subsidiaries of Southwestern Energy (NYSE: SWN) on Texas Gas' Fayetteville and Greenville Laterals. "These agreements are value enhancing for Boardwalk. The restructuring of Southwestern's transportation agreements helps Texas Gas achieve greater long-term revenue generation. It also provides future revenue upside through Southwestern's volume commitment of flowing gas from the Fayetteville and Moorefield plays. Our relationship with Southwestern and their long-term commitment to Texas Gas will provide an important source of supplies to support the growth of our end-use markets," stated Stan Horton, Boardwalk's president and CEO. The agreement lowers the contract quantities for Southwestern's existing firm transportation contracts on the Fayetteville Lateral through 2020 and adds new long-term firm transportation agreements on the Fayetteville and Greenville Laterals through 2030. Boardwalk will also have rights through 2030 to transport natural gas produced from the committed volumes that Southwestern Energy produces in the Fayetteville and Moorefield plays. For more information about the underlying firm transportation agreements, please refer to the Texas Gas FERC filing submitted on September 29, 2017, which can be accessed through this link: Texas Gas FERC Filing of Southwestern Restructuring. The terms of the other existing firm transportation agreements between Texas Gas and Southwestern will remain unchanged. 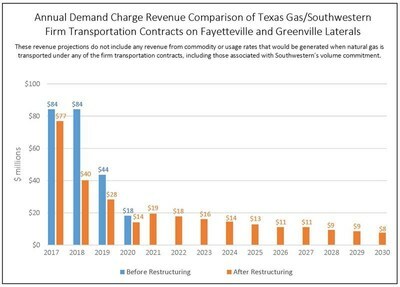 The chart compares the demand charge anticipated revenues under the existing contracts and the proposed new contracts. Forward-Looking Statement: This press release contains forward-looking statements relating to expectations, plans or prospects for Boardwalk Pipeline Partners, LP and its subsidiaries, relating to, among other things, approval of the restructured contracts by FERC and the resulting anticipated revenues from the restructured contracts. These statements are based upon the beliefs and expectations of Boardwalk management based on currently available information and expectations, and management expressly disclaims any obligation to update or revise these statements to reflect any change in its expectations, plans or prospects or any change in events, conditions or circumstances. Actual results may differ materially from those projected in this press release, due to a wide range of risks and uncertainties, including those set forth in our SEC documents.